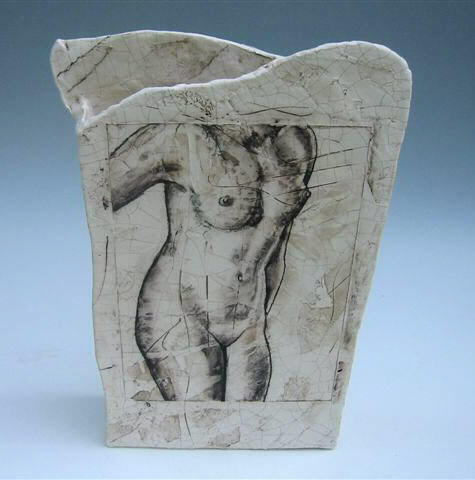 Art communicates by combining process, materials and concept, this fusion is particularly poignant in the world of ceramics. Peter Beard has explored this area through his ceramics for many years and his success is verified by international reputation. Making is central to the crafts and arguably it defines the nature of the man, the toolmaker. The earliest ceramics took the form of idols offered to the gods on a fire, thus proving that the act of making has spiritual and aesthetic considerations equalling, or perhaps exceeding, its utilitarian ones. Peter Beard is primarily interested in aesthetic considerations; his experience transcends the skill needed to create an object. It is his ability to define and create a beautiful object that singles him out. Although Peter is a master of the processes he employs, (usually slab building or throwing) he is not a slave to technique. He draws together slabs of clay to form an elegantly twisting line along the edge of a pot, yet he is brave enough to leave the rim pinched and fresh, acknowledging the act of forming the clay. If a process is to speak of anything then it must speak unabashedly of itself; the hand forming the clay. Every pot Peter makes bears testimony to this. Ceramics is one of the few areas where art meets science. The selection of materials is often based on empirical as much as on personal preference. It is when the research and preferences meet that a true sense of the maker�s intentions become clear. This is especially evident in Peter�s work with glazes. He is a man who takes risks, glazes bubbling here and running there. These risks have their dividend; the run of the glaze inform us directly of the subtle curves of a form, as gravity takes an opportune moment to intervene before being frozen as the kiln cools. The blisters represent a meeting of the two opposing glazes along a boundary defined by the makers hand; a pattern being too crude a word to articulate the juxtaposition of these two volcanic forces. It is Peter's combination of research, risk taking and self-criticism that enables him to keep up his fearless standard, right to the edge of what even he thinks possible. Peter is aware of historical ceramic precedents, the ancient art of Egypt is a touchstone for a lot of his recent work. He is no imitator though, and his work is a personal reinvention of the past, at once contemporary yet imbued with an archaic authority. This reinvention is born of Peter�s approach to his work. He sees himself as firstly a maker. It is by making that ideas reveal themselves and are refined. The act of making distils Peter�s experiences, be they a favourite landscape or a pre-Raphelite painting. The results bear no direct lineage to any one precedent, but they are a pretty potent brew. In Peter Beard's work the trinity of process, material and concept are so closely woven that it is almost impossible to tease them apart. Peter's ability to twist such tightly spun cloth shows his immense skill and determination. The end results speak clearly of the potter himself. It is no surprise that his pots have garnered such acclaim. LOST GLAZE TERRA SIGILLATA - RAKU All actual pieces are coilbuilt in different technics from grogged German stoneware clay. They are burnished when leatherhard and covered with thin layers of terra sigillata. That is a very fine shiny slip also used in ancient history in different cultures which I produce from special clay bodies. After a first biscuit firing again a second time layers of terra sigillata are put on followed by a second firing. Then the pieces are covered with a slip and glazed. They are fired in a gas kiln with following reduction in sawdust. With influence of water the glaze crackles away like an egg-shell, the burnished piece appears again. At least, a thin layer of beewax is put on the surface. Vessels which should hold liquid are made dense. I call this technic � VERLORENE GLASUR� ( Lost glaze). RAKU - A POEM (The opening speech of José Aerts roughly translated) Raku - Exhibition Deventer Sept. 15 th, 02 According to my books the first time the word Raku appeared in the history of ceramics was round 1600. This was when the Japanese emperor Hideyoshi commissioned a potter in Kioto named Jokei. It was a very special commission, because the emperor had given order to engrave a Chinese character in a golden mirror. This character (Raku) is best translated as �joy, meaningful contentment�, but also as �the very best of the world�. Earlier Jokei�s father was asked by an important tea ceremony master to make tea bowls for him. Tea bowls are essential in the practice of the tea ceremony, which has an important role in Zen Buddhism. The Raku bowls, that were commissioned, were in fact a sort of trade mark and a mark of quality that was exclusively given to this potter and his family. The name Raku became an honorary title. The first Chawans, as the Japanese call the tea bowls, were found however in archeological excavations and date from 10.000 years before Chr., when there wasn�t any Buddhism yet. These bowls had often an undulating rim and four uplifted corners. The first tea houses, Chashitsu�s, were built in the 15th century. In the Chashitsu�s the path of the tea, Sado, was tread. For the elite in Japan Sado was the occasion to invite guests and stay together in harmony in an atmosphere of style and refinement. The aimed balance and the serene atmosphere were reached by the careful rejection of the vessels, the precious old bowls, the ingredients and the furnishing. ( Sado was just one path, there was also the path of flower arranging, the path of poetry, the path of fighting; all belonging to Zen.) In 1911 good old Bernard Leach, father of modern British ceramics went to Tokio. He, in his young twenties was immersed then in the tradition of Zen and he participated in the Raku firing. He was inspired by Ogata Kenzan, Yanagi and later by the legendary Hamada. After this Japanese adventure he went back to his beloved St.Ives, where he settled his own pottery that became famous all over the world because of the introduction of Japanese ways of making, the techniques of throwing, glazing and firing. At present potters are still proud to have been an apprentice of Leach or his sons. Of great importance for contemporary Raku was finally the meeting of Paul Soldner and Rick Hirsch, both Americans, and a Japanese Raku master. They started a passionate discussion on the word Raku. The Japanese master had great objections against naming the work of these Americans Raku because of the lack of Zen philosophy. Raku in the original meaning was an intrinsic part of that philosophy. Then Soldner was willing to promote his work on the market as Soldner-ceramics but it was too late, his ceramics became known as American-Raku. This quick fired ceramic work fitted perfect in this era where fellow-artists like Jackson Pollock made name as action painters. The work of Soldner set the tone for a western Raku movement in which we potters of today all fit. It is up to you, the public, to start a debate with the artists present here about there opinion on this matter. I will leave the technical part of raku with this and continue on the content part. While I was Raku-firing myself together with 9 other potters in Macedonia the last 3 weeks I was thinking about a number of things which I want to share with you now. First I was wondering what I have in common with the exhibitors here and I came to the conclusion that it is at least the love for our profession, professionality is reflected in the created work. Work that does suppose we have looked into ourselves. With this I mean that we have done some introspection to find a personal theme before we expose our work to the world. Because when the concept has become mature, the seed can shoot and become fruit when brought onto the market, i.e. shop, gallery or museum. The poet J.C. van Schagen says: Being a stone in the sun Doors come and go The stone does not move Clouds drift The great rains are coming The stone does not move Nobody knows the stone No one has ever seen it The stone is. And yes here we are, potters impelled by a sort of madness to change an amorphous mass into a form that needs no explanation. Because isn�t it all about, that time after time artists try to exceed the language of word. To become speechless and still say everything. To imagine your own story becomes real and touchable. When today I look at the works of Gisèle, Horst, Martin, Inger, Susanne and Roland, each work touches a different string, each artist however has, with personal interpretations, used the same technique. The glazes we use in raku are in fact glazes that don�t fit so perfectly. They are so to say a too small coat for a too large body. Clothes that are to small tend to crack and tear; so is this coat. But every crack or tear makes us glad like mad, because this tore and cracked surface is an ideal base for our further treatment, CQ our practice of torture. Why do Raku-fanatics choose this path of fire and flame, of coughing and sneezing, tears on your cheeks, stinking like smoked eel, fire-tongs at the ready, don�t forget your gloves, again the eyelashes burnt... and than this moment of magic. The moment you once more defy the fire with body and limbs. Und in deinem unbenutzten Schimmer Spielt der Uberfluß der Untenwelt Where your flickering stayed empty plays the plenty of the shades It are these words of Rilke that come to me when I look at what surrounds me here. Isn�t it exactly the play of light and dark, of shine and dullness, where Raku derives it�s magic from? The shadow of scorched clay, alternated by fine or coarse crackling, traces of smoke on a polished skin, lusters and oil glow whisper a mysterious poem. And like a poem also the sense goes it�s own way. The obstinacy of the fire caresses with passionate tongues alongside the walls of pots and sculptures. Is raku firing not alike being a child again, allowed to play in the sandbox of time? At the same time the skin of the new work is reflecting eternity. This object weathered, scorched, eroded by fire, it�s almost archeologic, but just found, dug by ourselves from our deepest catacombs. When in your life all is about creating art, literally and figurative: if this fulfils you really and makes you happy and makes sense in living, then the only thing you can do is find the clay that suits you, practise and master skills and firing methods. Then you just go to your studio everyday to translate you secrets into this earthly material time after time. With one unique gesture you try then to make redundant all other gestures. And every time you might hope that what you could not tell in words will be clear and tangible in the emanation of your work. Who would not be willing to explain what moves him or her and find a benevolent ear? �Of the countless steps of my heart, he went maybe two or three�sighs a Haiku. So you stay hopeful that every season you will get closer to your own truth. Do you recognise this: you are on an exhibition and you think �why didn�t I catch this moment like it�s done here. Why do I always try to say too much in a piece of work, while �less is more�is the ambition of many. While the strongest work is almost always empty and quiet, returned into quintessence. Coming to your own quintessence, step by step moving along your own path of Raku. The path of fire and flame, the path of soul and salvation. Every new day you create your very best piece until today. Pessoa, the poet that never compromised has described it brilliant: To be great, be whole. Don�t make anything you are bigger or into nothing. Be all in everything Lay as much as you are in the least thing you do. Now let me lead you to the sculptures of Gisèle and see how groups of clouds draw shadows over her landscape. I carefully take a bowl of Horst in my hands and I concentrate on my breath: my breath goes in and out, in and out... until the tea flows over the rim and warms my lips. Then I open the lid of Inger�s pot and I hear her heart beating: so lively, but happily so irregular, so especially not perfect. In Martin�s bowl I collect tears and laughing through time, but Susanne�s boxes I don�t open. The Holy of Holies in these tabernacles may stay a mystery. Then I caress the skin of Roland�s terra sigillata pots and I touch his tenderness. So many stars fell from heaven into his vessels and they all smile on me. All these works, so much spoken without any word and still so much said. Colleagues, your work touches me. It is a feast to be surrounded by these languages of form, by your inspiration and your talent. It is a feast that we may festive this with all ceramics- lovers here at Loes & Reinier. Dear people let yourselves be touched, throw yourself OPEN.